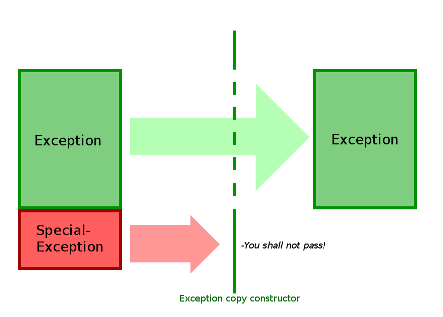 On the left side is the full SpecialException object, with its Exception part shown in green. The green line illustrates the copy constructor, which only lets the Exception part of the object throuh. The right way to write this would be catch (Exception& e), which would result in a reference to the original SpecialException. Thanks to polymorphism, this program will now print “Caught SpecialException”, whereas the original example prints “Caught Exception”. As a side note, always throw by value, not by pointer. That is, do throw Exception();, not throw new Exception();. After all, you want to be throwing an exception, not a pointer. And as always, there is no point in allocating on the heap if you don’t have to. Requiring people to clean up memory for you when catching is not very polite.